A British woman has been sentenced to six months in prison for slapping an immigration officer on the Indonesian tourist island of Bali after missing her flight due to an expired visa. Thousands left homeless by a powerful earthquake on the Indonesian tourist island of Lombok are sheltering in makeshift tents. 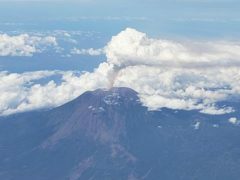 Mount Agung in Bali has gushed a 2,500-metre (8,200ft) column of ash and smoke for a second day.